NUS Geog Soc: Invitation to apply for MOE Outdoor Classroom 2013 - Overseas Field Trip Experience! 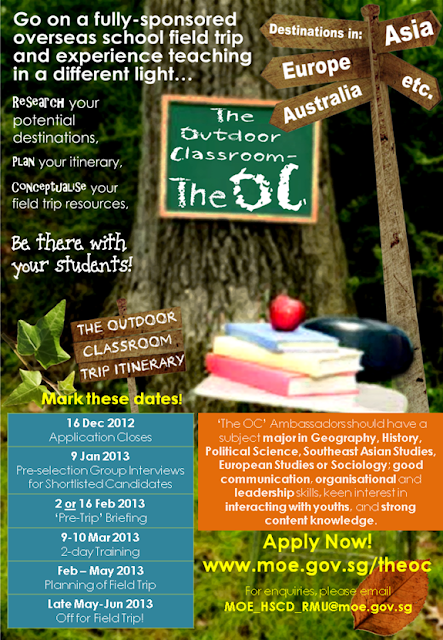 Invitation to apply for MOE Outdoor Classroom 2013 - Overseas Field Trip Experience! If you are thinking of teaching as a possible career, why not give it a shot by going on a FULLY-SPONSORED OVERSEAS trip (the “MOE Outdoor Classroom 2013”)? Please see below and apply to MOE by 16 December 2012. Many of our Geography majors have visited Vietnam, India and South Korea as part of the Outdoor Classroom and had a wonderful time learning more about classroom management while immersing in a foreign culture. You can too! Please see the poster attached and apply as soon as possible! Best wishes for your revision/exams and have an enjoyable vacation in December.